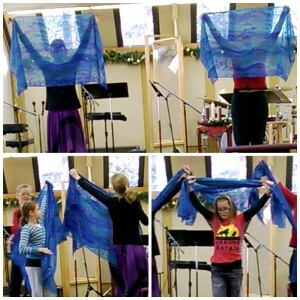 The first worship dance class I taught to homeschoolers. I’ve been working with children in my church to dance in worship for almost 15 years. I love dancing as part of a worship service at my local church, dancing with my church family, those I know well and with whom I serve in many other capacities. There is a richness, completeness and fullness to this kind of worship dance. However, two years ago, by what was an accident of mine, the Lord opened the door for me to teach worship dance to children outside my church, in the community. It was the beginning of an adventure I did not expect that has been a joy to me and allowed me to grow as a dancer and impact many more people through dance than I had hoped or imagined. Here’s what happened. 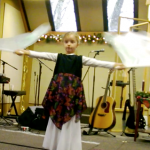 Two years ago, as I was preparing to gather a group of children to dance during advent, I sent an email out to the families in my church. 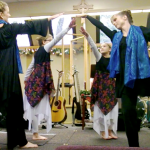 In it, I outlined the commitment I was asking, shared my vision for this dance and for worship dance in general, and asked parents and children to pray and consider whether they were called to be part of this dance. I mistyped the name of a mother in my church and ended up sending the email to a mother in my homeschooling community, who does not attend my church. She immediately emailed back and said her daughter would love to dance, would have no trouble purchasing the skirt and making the rehearsals, and asked if she could share the email with a friend of hers who had daughters that would love this opportunity. When I received her email and realized what I had done, I gulped. I was touched by her eagerness to participate and willingness to make these commitments, but I had concerns: First, I was concerned about pulling families from their home churches. 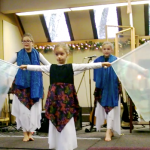 It would mean missing services at their own churches, and more significantly, risked feeling more like a performance since the girls wouldn’t be surrounded by the people they knew and worship with other Sundays. Secondly, our church is small and the space we have to dance in is small, so I didn’t know if I could add several more girls. 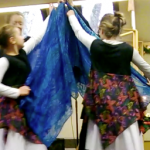 So, I countered with another offer: I would offer a worship dance class to girls in our homeschooling community, and we could end the class with a presentation at a nursing home. When I suggested this at a meeting of homeschooling moms, many mothers expressed enthusiasm, and so I offered that class in January, for no charge. Eleven children and two mothers signed up for the class. It was a complete joy to teach, the girls loved the class, and the mothers were so grateful to have a Christ-centered environment for their children to learn to dance. We culminated the class by dancing at a local assisted living facility and visiting with the residents afterwards. To learn more about the classes I teach, click here. 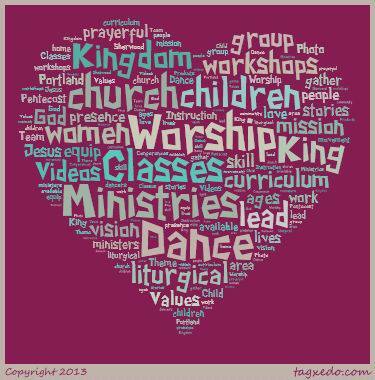 Next post: How I Went from Teaching as a Volunteer to Receiving Pay that Funds the Ministry. 1) Sometimes Less is More: The last two times we danced, we had 8 dancers, this time I started with only myself and 3 others. I couldn’t help wondering if it would be a bit of a letdown for the congregation, if we were going backwards as a ministry. But I chose to take to heart and rest in something I heard Pastor Lynn Hayden of Dancing for Him Ministries teach: We need listen to the Lord about each dance, not thinking we have to out do each previous dance, but knowing God works uniquely in each one. Of course, He did have a perfect plan for this dance. Because there were only four of us, I had more time to work with each person on the team. We got to really work through the kinks in the dance. Scheduling was much simpler. We were able to schedule an extra rehearsal easily when we found we needed it. There was an intimacy, focus, and unity to this group that was powerful as well as a joy for me as a leader. In this case, the Lord chose a small group, and less was more. 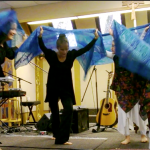 2) Trust the Holy Spirit with the Choreography and Dancers: I saw the Holy Spirit working through the process of choreographing and forming this dance. When I first envisioned thus dance, I saw five dancers (working with an odd number often works better with staging), including a young child. But four agreed to dance, the two children were more young ladies than small children. The young child I felt would be perfect couldn’t commit to the rehearsal schedule and so declined my invitation. So I choreographed for four. I loved what God have me for the four of us. Two weeks before dancing, I could still see this young dancer in the final part of the dance. Her part would be short and simple, but powerful. So I asked her mother again if this young girl might be up for participating in the last few rehearsals. She was delighted. When she entered, she commanded the stage and there was a collective gasp from the congregation. Something about this young girl who danced with power added a critical element to the dance. The Lord knew what He was doing all along. She didn’t need to be at all the rehearsals (in fact her absence freed the rest of us to work our our parts of the dance). She was available when we needed her and completed the dance. Choreography is a process, The Lord doesn’t reveal everything at once, but he knows what He is doing. I learned to trust Him and be flexible. 3) The Devil is in the Details, so Be Diligent about Details: If we have prepared well in the large things, the Enemy will try to derail us through the small things. Because of some complicated staging issues with the worship team, we decided not to do a run through of the dance on stage the morning of our worship dance. We warmed up and practiced in another room. I gave my iPod with the song to the sound tech and talked him through all the details about what we needed from him. But I didn’t have him run a sound check. I know, you’re thinking, “Are you kidding? What were you thinking?” Honestly, I think it was the people pleaser I me that didn’t want to trouble him. (Satan know our weaknesses) The sound tech didn’t think we needed to play the song, and I went along with that, not wanting to be a pest. When it was time to dance and he started the song, the music was barely audible. The sound technician raised the volume, but we had missed the 8 counts of the song. The song had a dramatic beginning, one I was not willing to miss (one that isn’t recorded on the video – another lesson for me about details). I did not let this derail us, though. Without flinching, grimacing, or showing distress or annoyance, I turned around and said, “Can you back it up, please?” We started over, and it was quickly forgotten. Nonetheless, it was a lesson for me: Do a sound check, always. Don’t leave room for the enemy to bring trouble. A man in our congregation said to me, “Dance has never really spoken to me, but what you do with the children moves me deeply. I can’t really explain it.” The Lord had been present and had touched him through the dance. In I John 4:4 it is written, “Greater is He that is in you than He that is in the world.” God is greater than the enemy and His grace covers our shortcomings. He desires to touch and bless people through the dance, and if we are submitted to Him, His purposes prevail even if not every details is perfect. Glory to Him. What has the Lord taught you recently about preparing to minister? Please share in the comments (the comment button is at top, just before article). I would love to hear, and it will help others. When my oldest son went to preschool, his class prepared a Christmas program to present to the parents. His teacher told them as they practiced for this big event, “This is your Christmas gift to Jesus.” My son, who doesn’t normally care for performing, set his heart on being a wise man, practiced diligently, and walked tall, bearing a crown and toting a box of frankincense. I loved the way his teacher framed their program – as a gift for Jesus, something they could put their heart into, do their best and offer to the Lord. I admit, while I love receiving gifts, buying gifts often feels stressful to me. Will they like what I chose? Can I afford what they would like most? Have I chosen the right color, style, size, etc. But when I have a gift that I am confident is just right for my loved one, one that fits them to a tee and that expresses my love to them, I love giving the gift. It gives me joy anticipating when I can give it. Giving just the right gift is a delight. 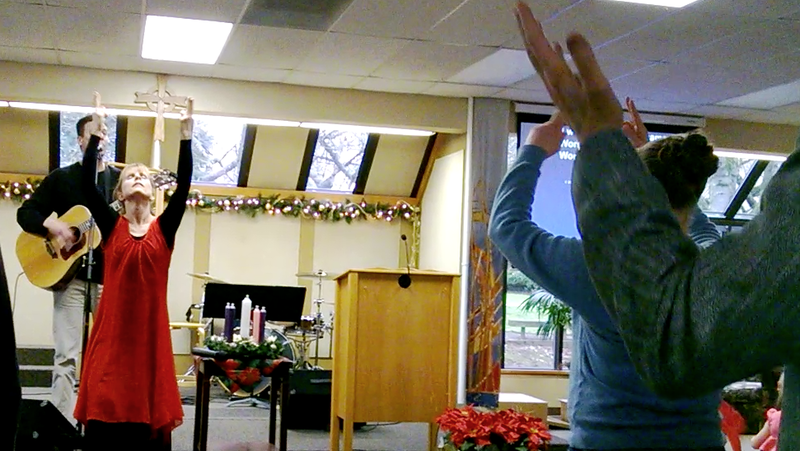 So, when I prepare to dance during advent, I remind myself that this is my Christmas gift to the Lord (and to His people). It infuses rehearsals with a greater joy and purpose. I tell my team, “This is your Christmas gift to the Lord.” The children walk taller knowing that they have something to give the Lord who has given so much to them. Of course, every gift to the Lord is simply returning to Him what He has already given us. Nonetheless, He loves it. 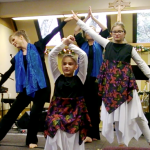 This year our dance team is preparing to dance to a song written by a friend of mine, Doug Eltzroth called, “And a Child Shall Lead Them,” based on Isaiah 11:6-9. My team is working hard, we love the choreography. We can’t wait to share the dance with the congregation. The song talks about the healing, reconciliation, peace and restoration that Jesus brings. We are praying for God to bring healing and restoration to individuals and families in our congregation. We are praying for Jesus to work powerfully in people’s lives. We are looking forward to the joy of dancing. And I can’t wait to give this latest gift that I am working on to Jesus. 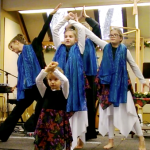 Are you dancing for advent? I’d love to hear about it (better yet, see videos – feel free to leave a link). I pray that He fills you with joy in the giving and equips you with all you need to offer Him your best. Matthew 2:11 And when they were come into the house, they saw the young child with Mary his mother, and fell down, and worshiped him: and when they had opened their treasures, they presented unto him gifts; gold, and frankincense and myrrh. Will You Trust Him with the Desires of Your Heart? I’m writing this post from my parents’ home in Arizona. I’m so thankful to be able to spend this holiday with them. It’s been over ten years since I’ve spent Thanksgiving with my parents, as my husband and I decided years ago that flying at Thanksgiving is too costly and difficult. But this year, I felt like I needed to see my family. It had been too long. I wanted my children to spend time with their grandparents sometime during the holidays. Friends prayed for me, and the Lord opened a way. I’m so grateful that He cares about the things that matter to us. This vacation is bringing a needed rest for me and for my family. I’ve been super busy over the last six months – first completing my website, then writing and finishing my e-book, then preparing to teach at a couple of teleseminars, all the while homeschooling my three boys and teaching worship dance to children. I write this to acknowledge what God has allowed me to to. He allowed me to complete these works, to gain satisfaction from the work, and to touch the lives of others. He has been gracious to me to permitting me space to pursue what’s been on my heart. He has shown that He cares about the things that matter to me. Accomplishing these ministry projects has come challenges, though. My husband and children have been missing me. I have felt torn between home and ministry, even though they should be one. So, this time while I’m in Arizona is affording me the time to connect better with my children, to play with them, to listen to them, to enjoy them. 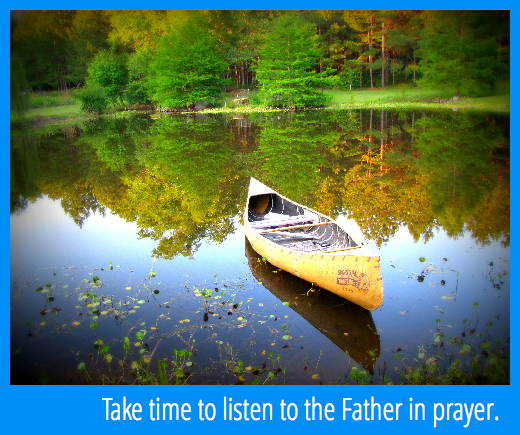 And it’s offering me time to reflect, to ask the Lord to help me to learn how to order my time aright. (Lord, teach me to number my days aright so that I might gain a heart of wisdom. Psalm 90:12) There is always enough time for what He has called us to do; however, I need to be connected enough to Him to distinguish between what He’s really calling me to do and what activities are distractions. I’m asking Him to give me willingness to let go of anything that is a distraction as well as willingness to give myself to the work that matters most to Him. What desires of your heart has the Lord allowed to come to fruition this year? Are you at peace with how your home life integrates with your ministry and how your lifestyle supports your callings to each? If so, I would love to hear how. Please comment and share. Are you clinging to any worthless idols that stand in the way of receiving grace from the Lord? Remember that God is the gift of every good gift. Don’t be deceived by the enemies lies. Trust the Lord to give you what is truly good. 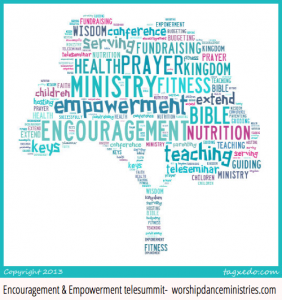 Author AmyPosted on November 27, 2013 January 14, 2014 Categories InstructionTags biblical teaching, dance ministry, ministry leadership, praise dance, time management, trusting God, worshipLeave a comment on Will You Trust Him with the Desires of Your Heart? When we minister, we want to bring a word from the Lord. If I am dancing, I’m not looking to hear people say, “Oh that’s so pretty,” or , “You’re so graceful.” I cringe if that is the only response I receive after ministering through dance. 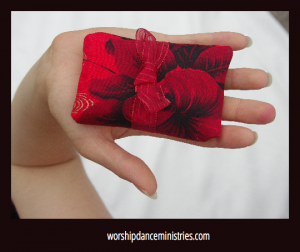 What I really want and am praying for is that they would hear from the Lord when I dance. His words to them will bring life, it will change them. In I Peter 4:11 Peter writes, “If any man speak, let him speak as if speaking the very words of God.” That’s God’s desire for us, to speak His word; however, any of us who claims to bring a word from the Lord needs to do this soberly. In the book of Jeremiah, the Lord rails against the false prophets of Jeremiah’s time. We need to be careful, if we think we bring a word from the Lord. A false prophet misrepresents the Lord. They look to please people, but instead lead them astray, inviting God’s wrath. That’s what most of the prophets in Jeremiah’s time were doing. So how do we make sure that we aren’t just doing, being false prophets? 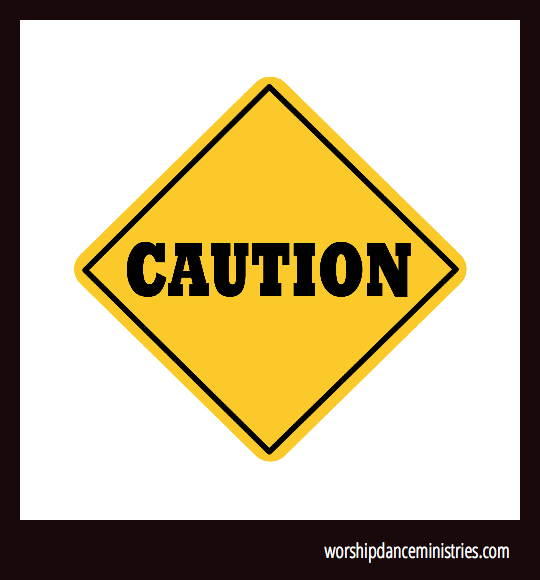 This audio gives warnings and encouragements to those who feel called to bring a prophetic message to others. Please excuse the abrupt start to the recording. 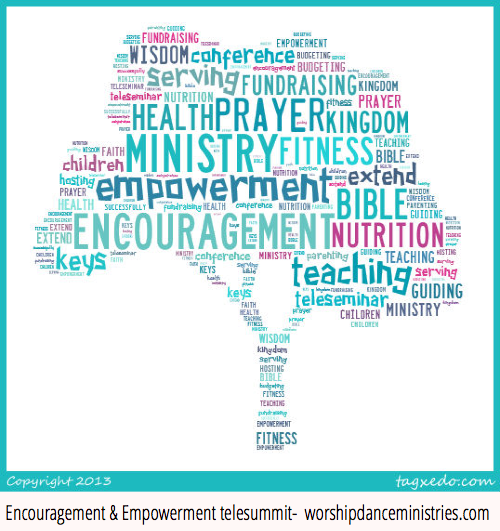 I am so excited to be hosting a Dancing for Him conference in August of 2014. Dancing for Him is an internationally recognized dance ministry that has helped me grow as a dancer and a dance ministry leader. 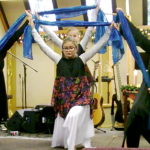 I attended a Dancing for Him Conference on Anderson Island in June of 2013 and came home with my toolbox full of exciting ideas for choreography, team building, and creative movement as well as full of the Holy Spirit’s joy and power. So, to be hosting a conference in my neck of the woods is an incredible opportunity for me to be equipped as a worship dancer, to equip other worship dancers in my area, and to invite the presence of the Holy Spirit more fully on my home church. 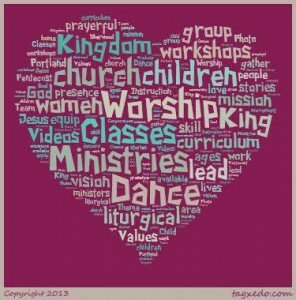 Would you love to learn many aspects and concepts of worship/expressive dance? Would you love to learn some fresh movement and choreography ideas? 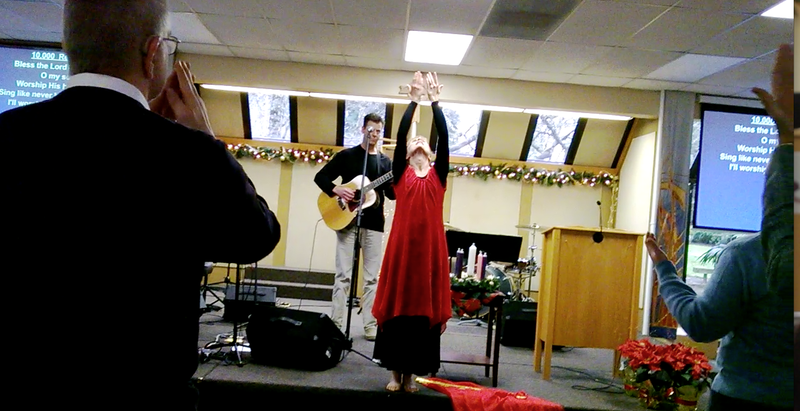 Would you love to receive ministry through and be activated in prophetic dance? I’m usually nodding off around 10:30. But this was a project I couldn’t get done during the day with my kids wanting me, or wanting my computer. And I couldn’t get it done on a normal night after they went to bed, because that’s when my husband and I get to catch up. So, I burned the midnight oil for a couple of nights and, by the grace of God I did it. 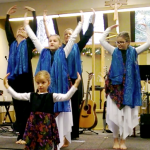 I made a 3 minute video introducing my worship dance curriculum for children, And a Child Shall Lead Them – Ten Worship Dance Lessons for Children. This book, which is close to my heart, contains my ten favorite lessons to teach children about dancing for Jesus. In it, I instruct teachers/leaders/parents how to lay a biblical foundation for dance for their children, how to build a vocabulary of worship, how to dance the scriptures, and how to keep a kingdom mindset through it all. The book has clear lesson objectives, lists of songs to choose from, photos, lists additional resources, and two short videos that come with it. I think it’s really valuable and I want to get it into the hands of many parents, dance teachers, and children’s ministry leaders. It’s not cheap, so I know that for someone to buy this curriculum, they need to know what they can expect to receive before they purchase it. That’s why I created the video, to give a brief but meaty overview of what is in this curriculum package. So, take 3 minutes, click the video above, have a look and let me know what you think. By the way, I hardly felt tired over the next two days. God gave me grace. It reminds me of a favorite promise of God’s that my mom used to quote on busy days, “and your strength will equal your days,” Deuteronomy 33:25. He gave me strength to match the day. Is there something you have really wanted to do that keeps getting pushed out by the urgent tasks of your day? Take a couple of nights and burn the midnight oil or get up before dawn. Ask God for strength to meet the day and just do it. You’ll be blessed, and others will through your work. Author AmyPosted on October 25, 2013 November 7, 2013 Categories Classes for Children, Instruction, Products available, Videos2 Comments on I did it! Come be encouraged and inspired. Next week I have the privilege of being a speaker in a tele summit with six gifted and anointed women, and I would love for you to be there. Think of it as a women’s retreat on the phone. No, you don’t get the weekend away from all your responsibilities at home, but you also don’t have to travel or arrange for your family while you are gone. This is complementary, no cost to you at all. The summit will take place Monday, Tuesday, and Wednesday, October 28, 29, and 30, from 7:00-9:00 PM EST (4:00-7:00 for those of us on the west coast) HOWEVER, it will be recorded, so even if you can’t make a single live session, I encourage you to register. You’ll then be able to download the audio files, but them on your ipod, and receive encouragement and equipping while you run, while you take your morning/evening walk, or while you are driving. Of course, if you can make it live, do it — you get the interaction, the give aways or special offers (I love those). So you know, my teaching portion will be from 8:00-8:30 PM (5:00-5:30 PST). Don’t miss this, I would love to have you there and I know you will be encouraged and equipped. Please feel free to pass it on to any friends whom you think would be interested. Author AmyPosted on October 24, 2013 November 7, 2013 Categories Conferences, InstructionLeave a comment on Come be encouraged and inspired. Is God tapping you on the shoulder? When a friend and teacher, Cathy, shared this understanding of prayer with me, it changed the way I prayed. I began to see that prayer is not so much about me convincing God to act in the world as it is about me releasing the authority He has given me through Jesus to bring about His kingdom, to do the good works He stands ready to do in people’s lives. In light of this, prayer is more about listening to the Father to find out what He wants to do, and then speaking it into being. If I am willing to listen, to be attentive for that tap on the shoulder, that quiet thought that pops into my mind, for that nudging of the Spirit, I get to be the vehicle He uses to bring healing, deliverance, encouragement, provision that He wants released in someone’s life. Some of you have shared specific prayer requests with me, and I am praying for you. I’m working on not just voicing my hopes for you, but listening to what the Father is doing in your life. If you would like me to pray for you, please let me know. 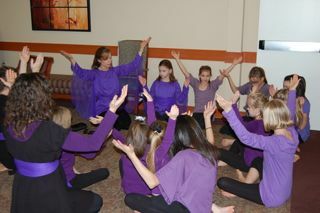 Thank you to those of you who are praying for the dance classes I am teaching now. I have sensed God’s Spirit at work through your prayers. Author AmyPosted on October 14, 2013 November 7, 2013 Categories Instruction, Mission/ValuesLeave a comment on Is God tapping you on the shoulder?